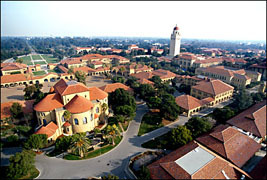 Stanford University is a wonderful place for learning. After Professor Freccero's course on "Dante's Paradiso" (Spring 2001), I extended my library privileges to use their libraries. Often I'll notice posters and flyers on campus of outstanding scholars invited to Stanford for lectures that are open to the public free of charge. Listed below are my notes taken at these lectures at Stanford University and a few outside events of interest. Also added are relevant web links to the lectures as well as books & sources recommended by the speakers in the pursuit of greater learning. (Note: * Links are inactive on notes not yet typed. Cyan colored dates = notes completed). 3 pm-5:00 pm Prof. Seth Lerer, Stanford English Dept. "Marginalia: Writing Outside the Lines"
"When Buddhism Became a Religion"
"The Last Three Houses of Zen: Guiyang, Yunmen and Fayan"
"Psychedelic Explosion! The Beats, Ginsberg to Kesey"
"Are You Living in a Computer Simulation?" The Case of Early Medieval China"
Eliezer Yudkowsky, Bill McKibben, Sebastian Thrun. "Revelations of Zarathustra: Poetry of Mysteries & Mysteries of Poetry"
"The Gospel of Judas A Revolutionary Text?" "The Second of the Five Houses of Zen: Caodong (Soto)"
the English subtitles version of Enlightenment Guaranteed was not available. "Whitehead's Account of the Sixth Day"
Immune Networks: A Whiteheadian Future for Science Studies"
"India's National and Cultural Identity in the Age of Globalization"
"What Makes Holy Scriptures Holy? Rethinking the Idea of a Buddhist Canon"
"Buddhism in Korea: Its History and Downfall"
"Science & construction of the Pierre Auger Observatory"
"Cosmic Rays: A Fascinating Scientific History"
"The Role of The Panchen Lama in Tibetan Buddhism"
Terrorism and Build Nations... One School at a Time"
2:15 pm-4:00 pm "Me You Them"/"Eu Tu Eles"
"The First of the Five Houses of Zen: Linji (Rinzai)"
Some Problems in Theravada Buddhism"
"Zarathustra: The Man and the Message"
"Family Matters: Kinship Bonds and Buddhist History in Tibet"
"Chinese Bronze Age Ritual Vessels"
"Buddhism More than Religion: The Gifts of the Tibetans"
"One-Night Enlightenment: Important Masters of the 7th & 8th Generations"
and a Comparison with Stories of Abraham & Sarah in Genesis 12 & 20"
Lecture Discussion: "Analogy as the Core of Cognition"
Presidential Lecture: "Analogy as the Core of Cognition"
"The Life and Death of a Genre"
"The First Theorists of History"
Chinese Zen Masters: "The Illiterate Prodigy: The 6th Patriarch Huineng"
Chinese Zen Masters: "Why Did Bodhidharma Come to the East?" "Zoroastrianism and Its Contributions to World Religions"
"The Dalai Lama and His Visit to Stanford." Discussion Seminar: "Hard-Core Eroticism: In the Realm of the Senses"
"Romance and Riddle: Buddhist Literature of Siam"
such as TV, video games and computers. Strategies for setting limits. Dr. Dean Rickles, University of Calgary, "What Price Determinism?" "The Great Sumatran Earthquake and Tsunami"
"Miracles and the Historical Method"
"Physics History of the Present"
"Distributed Systems and Conscious Unity"
"Going Deeper: Discover Your Full-Spectrum Self"
"A Tale of Two Christianities"
Lecture: "Science as Work: Modern Obsessions"
Seminar: "The Morality of Natural Orders I: The Power of Medea"
Lecture: "Science as Pleasure: Enlightenment Seductions"
"Beauty in Art, Music, Literature and Philosophy"
"Engaging Rai: A First Look at Ch. 34 of Kajiwara Shozen's Ton'isho"
"Hot Springs, Herbal Pills, and Talismans"
"Theology in the Laboratory? New Light on Isaac Newton's Alchemy"
7 pm-9 pm Anna Patterson, Stanford Computer Science Dept. Curator of "From Forreine Places All the Varietie of Herbes"
9:30 am-5:00 pm William B. Hurlbut, M.D., Paul Ekman, Ph.D., George Lakoff, Ph.D., Anne Colby, Ph.D.
What is a Buddhist poet? And what is a Buddhist poem? 4:15 pm-5:30 pm Urs Hölzle, Google Fellow, Google, Inc.
7:30 pm-10 pm Dr. Stephen Wolfram, CEO, Wolfram Research Inc.